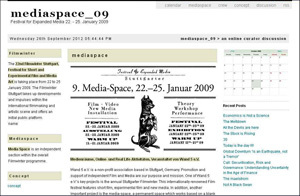 The international online-curator-team of artists from various backgrounds that formed the team developed in strictly remote interaction the concept for the >media space 09 – open space< exhibition space. The mediaspace_09 blogging platform provided a public space for the ongoing online curator discussion and was regarded as a tool for exchange, information and contribution. 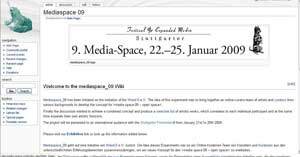 Aside my contribution in the curator team, I was also responsible for the development of the blog and established as an informational tool, that can be seen as an online catalog, the wiki.media-space. Wand 5, the initiator of the project is an non-profit organisation based in Stuttgart, Germany, which promotes and supports independent Film and Media projects. One of Wand 5 e.V.’s key projects is the annual Stuttgarter Filmwinter. This internationally renowned Film festival features short film, experimental film and new media. In addition, another important project is the media-space, a permanent space which works based on a blank canvas principle for art media presentations. For the first time Wand 5 e.V. was announcing an open competition to select the media-space 09 curatorteam. There were no limitations on the means of implementation. The purpose of this open competition was to establish a new experimental space – an >open space< in which artists can perform. The project will be presented to an international audience from January 21st to 25th 2009. Posted on by mojae. This entry was posted in curating, Media. Bookmark the permalink.